The VSW – The Insurance Pool for Accountants offers insurance coverage for their professional activities in Germany as well as internationally active auditors and tax advisors. VSW specialises exclusively in the professional liability insurance of auditors and tax advisors and has thus built up expertise over decades. We are the only provider with such a specialised, international expertise and see ourselves as a partner to the entire profession of auditors, as well as our policyholders, in Europe. Owing to our special organisational structure as an insurance pool comprising three of the most important insurance companies, we enjoy outstanding economic solidity. At the same time, we combine the advantages of a small and professionally independent organisation. We offer our insured auditors and tax advisors the highest degree of trust and individual services based on a genuine and active partnership, and organisational culture. Since the establishment of our organisation, the auditing and tax consulting professions have been represented on our committees. This method, which is firmly anchored in our institution, is used to facilitate a professional exchange between auditors, tax advisors and us in order to promote mutual understanding. Our task is to contractually design the individual insurance coverage of the auditors and tax advisors insured with us and to advise them on liability and coverage on an ongoing basis. In the event of a claim, we stand by our policyholders by settling justified claims for damages and dismissing unjustified claims in order to protect the reputation of the auditors and tax consultants insured with us. Our experienced employees deal exclusively with the professional liability insurance of auditors and tax consultants and are highly specialised. In addition, we are supported by a permanently optimised international network of specialised lawyers. We are a competence centre in our industry and an important contact for the auditing profession. Due to our experience and specialisation we offer a maximum of professional expertise for the insurance coverage suitable for individuals and the liability of the auditors - including in the international context. Through an expressly cooperative attitude towards the auditors insured with us and excellent service quality, we strive to achieve their fullest satisfaction. Providing personal care and the best possible support are our primary concern. A distinctive customer understanding enables us to offer individual insurance solutions. We are the specialist in the field of professional liability insurance for auditors. This specialisation reflects the concentrated professional expertise of our employees. We approach auditors and our business partners insured with us in a respectable and discreet but unpretentious manner, and always act in a solution-oriented, flexible and cooperative capacity. We pursue our tasks with the necessary objectivity, but we are also passionate about what we do. As the first and thus the longest-established provider in the industry in Germany, we can look back on a history rich in tradition, which makes us committed to value-oriented action in every respect. Due to the strong underlying insurance companies, we are financially well-funded and efficient. Nevertheless, we remain professionally independent and are not subject to any economic conflicts of interest. Our reputability, reliability and trustworthiness as well as absolute discretion provide our customers with additional security. For decades, the "Versicherergemeinschaft für das wirtschaftliche Prüfungs- und Treuhandwesen" had been known as a specialised provider of professional liability insurance under the name "Versicherungsstelle Wiesbaden". At the beginning of 2018, the traditional brand was transformed into "VSW – The Insurance Pool for Accountants" and given a new look. This does not change any of the proven benefits for existing insurance relationships with the customers. Nevertheless, the external change is not only cosmetic in nature: it symbolises the internal changes of recent years and the future-oriented position of the insurance pool. The change to the name has no effect on the existing insurance coverage under the previous name "Versicherergemeinschaft für das wirtschaftliche Prüfungs- und Treuhandwesen" (Versicherungsstelle Wiesbaden) – therefore no new insurance policies are required. The contracting parties to the insurance contracts are – as previously – the insurers Allianz Versicherungs-AG (42%), AXA Versicherung AG (34%) and ERGO Versicherung AG (24%). Nothing has changed in this shareholding. There are various reasons for modifying the brand name and the visual appearance. Organisational culture has changed in the recent past, but has still adhered to the values that have evolved over time. Neither this modernisation nor the pronounced awareness of values and tradition with its approximately 80-year-old roots were adequately expressed in the appearance that has existed for decades. The simple and pragmatic abbreviation VSW takes account, among other things, of the internationalisation of the business field and digitisation. The existing name also proved to be too unwieldy in Germany, partly misunderstood because of the local reference and considered to be outdated overall. The strong insurance pool emerged from the first initiatives in the 1930s to establish professional liability insurance for the still young profession of auditors. With its distinctive and constantly growing expertise, VSW remains a unique specialist insurer of professional liability insurance for auditors and tax advisors to this day. The insurers are represented by the head of VSW. The insurance contract only entitles and obliges the insurers with their respective shares stated in the insurance policy. 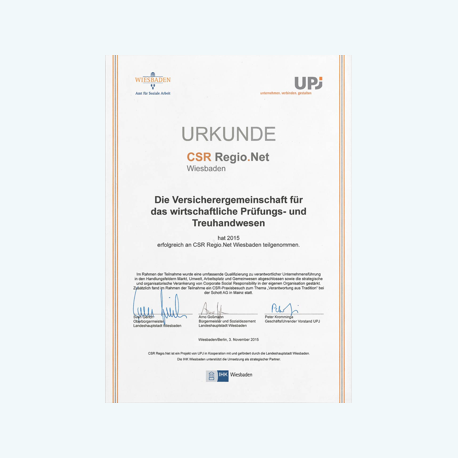 We have been participating in the CSR Regio.net Wiesbaden project since 2015. Building on a comprehensive qualification in responsible corporate governance, we are dealing with this topic in depth and are further expanding our commitment. Since September 2017 we have been involved with WiesPaten and have sponsored nine pupils (8th grade) from an integrated comprehensive school, whom we will accompany until they complete their schooling. The aim of sponsorship is the holistic promotion of children and young people – from the empowerment of personality development and social competence to cultural education. Within the framework of "Wiesbaden Engagiert" (commited Wiesbaden) we became acquainted with Naturefund e. V. in 2015 and have been involved in the preservation and care of orchards in Wiesbaden ever since. We are also promoting a project by the non-profit nature conservation organisation Naturefund e. V., which is specifically committed to protecting forests, planting trees and protecting intact ecosystems. We also support the nature conservation work of the Frankfurt Zoological Society. 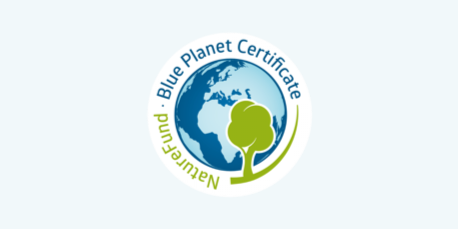 With our donation we contribute to the protection of endangered plants and animals, as well as to the protection of ecosystems as climate regulators and water reservoirs on a lifelong basis.